The Loma Prieta earthquake caused significant damage to the San Francisco bay area in 1989, killing 57 people and injuring more than 4,000. Tens of thousands of baseball fans were filing into Candlestick Park as the San Francisco Giants and Oakland Athletics were minutes away from starting a World Series game when the quake started. Violent shocks knocked out all power inside the stadium, including ABC’s television feed of the game. In an age before smartphones, all media coverage and communication from the site went dark. ABC began full coverage of the damage 40 minutes later. While most power outages stop games for a few hours or a day, the quake’s devastation forced Major League Baseball to delay the World Series for 10 days. The A’s would go on to sweep the series in four games. Candlestick Park suffered no structural damage, due in part to engineering crews completing a seismic strengthening project on the upper deck’s concrete and windscreen. Bridge outages across the Bay Area forced similar seismic retrofitting with an estimated damage bill to the state’s highway system ranging into the billions. Conspiracy theories surrounding the power outage flew from all sides. Players blamed their respective opponents. Executives shot snarky tweets at one another. Post-blackout, the 49ers stormed back into the game, scoring 17 points in the third quarter to close within five points of the Ravens. The game came down to a fourth down play at the goal line with San Francisco gunning to take the lead. Colin Kaepernick’s pass, intended for wide receiver Michael Crabtree, dropped incomplete, and the Ravens survived to win. Known throughout the world for their respective rabid fan bases and World Cup wins, Brazil and Argentina’s national soccer teams have few equals on the pitch. A failed power grid in Resistencia, Argentina ruined a match between the two clubs in 2012 in front of a packed crowd of over 25,000. With half the stadium’s floodlights dark, players operated in shadowy conditions for minutes. Referees finally made the call to stop the game after goalies on both teams commented that they couldn’t see incoming shots. Crews couldn’t guarantee when the lights would come back on, prompting Mano Menezes, Brazil’s head coach, to comment that clubs of Brazil’s stature shouldn’t need to worry about electrical problems. Brazil, ironically, experienced similar issues in 2014 when hosting the FIFA World Cup. Reports of unfinished airports, multimillion-dollar stadiums used only for four games, and utility strikes that put the power grid on shaky ground made one temporary outage in Argentina seem minor by comparison. Game four of the 1998 Stanley Cup Finals almost saved the Boston Bruins’ season. Saddled with a three-game to none deficit and facing a complete Edmonton Oilers team, a timely power outage at Boston Garden was just what the home team nearly needed. The Oilers had just scored to tie the game at 3-3 — in fact, they were still celebrating — when the entire arena went black. What was the culprit for the sudden and total loss of power during the championship event? Fog. Apparently, power fluctuations were common during the summer months thanks to the cold playing surface mixing with warm air. Officials didn’t just postpone game three — they canceled it altogether. That’s right; they wiped every trace of it from the record books. Two days later, the Oilers and Bruins played a new and improved game four, which should technically serve as game five, where the Oilers trounced the Bruins 6-3. Boston would need to wait until 2010 for the team to hoist The Stanley Cup again. Sometimes, the power grid fails due to sudden surges across the network. On other occasions, water vapor can conspire to ruin the system. When it comes to the Metrodome, however, the building itself can cause the blackout. The stadium’s glaring need for repair became blatantly obvious to the entire country when whole sections of its roof collapsed under heavy snow in 2010. Millions of dollars in lighting and video equipment met untimely ends on the unforgiving turf. The NFL had no choice but to move a game between the Minnesota Vikings and the Chicago Bears to the University of Minnesota’s TCF Bank Stadium where they had to play outside — in December. Minnesota lost that game in epic fashion by more than 30 points. This wasn’t the first time such a collapse happened at the Metrodome. On five other occasions throughout the 1980’s, Minnesota snow caused roof sections to buckle. After the 2010, experts reviewing the site estimated it would cost about $18 million to fix, requiring workers to replace the stadium’s roof in its entirety. The Vikings played their last game at the Metrodome in 2013, besting division rival Detroit Lions by one point. Crews completed demolition of the site in April 2014. Major sporting events attract millions of viewers from around the globe. 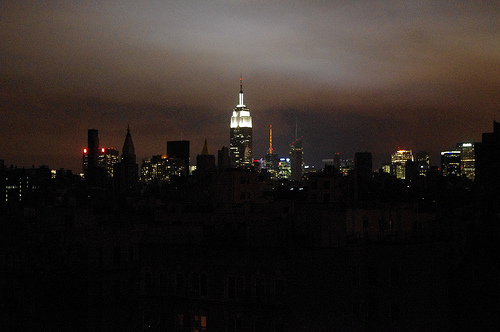 Power outages are a fact of life for them, but even a temporary loss of light doesn’t need to stop these events. Forces of nature can’t be stopped, but, in many cases, having industrial generators on hand can help make sure not even a single play is missed.